Want to celebrate Memorial Day weekend right and have fun at the same time? Then register now for the Inaugural Big Apple Run For The Warriors® 3-mile or 1-mile run/walk. A ceremony to honor our fallen and wounded begins at 8:30 a.m. followed by the race at 9 a.m. 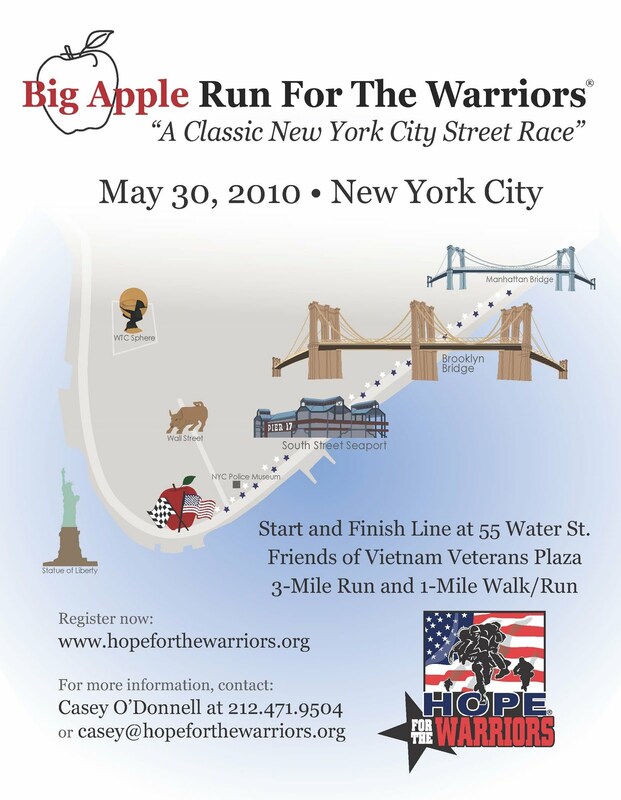 The race begins and ends at the NYC Vietnam Veterans Memorial and racers will also pass the NYC Police Museum, Wall Street, Fulton Fish Market, South Street Seaport as well as pass under the Brooklyn Bridge. All proceeds for the race will benefit Hope For The Warriors®, a nonprofit organization that assists wounded service members, their families, and families of the fallen. Registration is $30 for adults, $15 for college students. Active-duty military, their families, and ALL children under 18-years old are FREE. Grab your sneakers, bring out the whole family, and celebrate Memorial Day with Hope For The Warriors®. This are such great races to run! I ran their race in NC and they are fun and inspiring.